Surprising, sensational, inexorable. 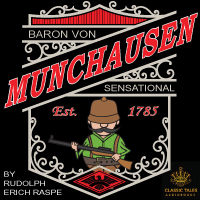 These are the adventures of Baron Munchausen. See him escape from the jaws of a hungry lion, shoot a stag with cherry stones, climb a beanstalk to the moon and many other fantastical fables.